Fall is upon us. The leaves are dropping, the days are ever shorter and school is in full swing. 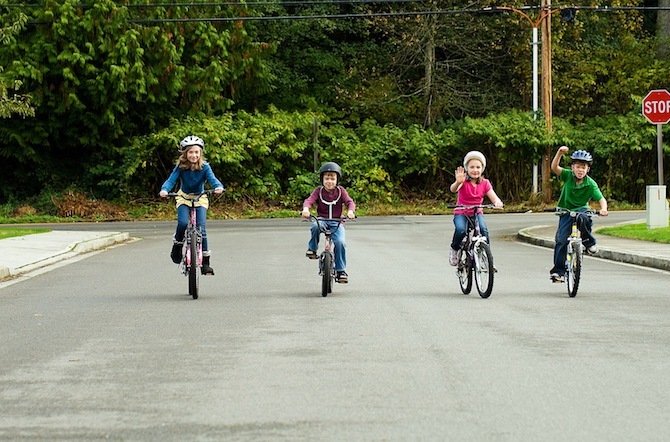 While we are a long ways off from endless sunny days and warm weather, kids are still taking to the streets, trails and paths to bike to school. This past May, Raleigh Bicycles partnered with PeopleForBikes and Century Cycles bike shop to support the largest and longest-standing bike to school event in the U.S. – the Bike to School Challenge. During the month of May, more than 4,000 students from six schools in Northeast Ohio put the pedal to the pavement and biked to class, collectively riding 41,179 miles total. No small feat when you consider the 1,647,160 calories burned, $6,326 in gas savings for parents, and the 33,827 lbs. of carbon dioxide that was prevented from entering the atmosphere. We recently checked back in with crew that coordinates the annual event, and it turns out a lot has been happening in Ohio. 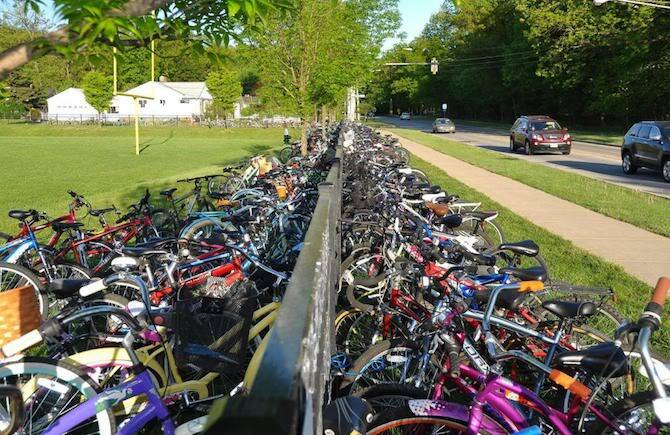 Despite the lack of a dedicated “Bike to School Challenge” this fall, Scott Cowan of Century Cycles reports: “the bike racks are full to over-flowing every day. Kids are even locking their bikes to the trees around the school!” The Rocky River City School System has recently ordered 13 Saris bicycle racks to meet some of the demand, with each rack holding over 18 bikes apiece. The racks will be distributed around to the city schools where the supply of bicycle parking spaces is limited. “The Bike to School program has definitely sparked interest and support in the community,” says Wendy Crites, a health and fitness teacher from Rocky River Middle School. Most recently, the town has posted bike signs around town and near several of the schools. While many kids make riding their bike a priority, some are still learning the ropes of two-wheeled transport. Crites is in the midst of developing a program where she can train several 8th graders on how to teach the skill of bicycling. Those select students would then share their knowledge with primary school children in an effort to get more kids on bikes at an early age. One of Crites’ colleagues at the primary school has even collected 13 bikes from local families that will go to younger students who will soon learn how to ride. The community in NE Ohio knows how important it is to make cycling a habit for youngsters early on. Cowan was recently invited to be on a committee to oversee a state funded study to determine the best way to make their commercial district more bicycle and pedestrian friendly. During their first meeting two mayors were in attendance, both of whom are “pro cyclist” according to Cowan. With local officials taking note, it’s not hard to see how effective grassroots bike advocacy can be.